Designed around a full size till, the narrow footprint of the Series 100 minimizes the amount of counter space required. 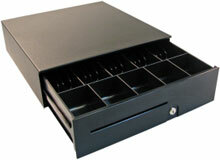 There is still ample storage in a deep under-till compartment to hold coin rolls and packaged currency. The APG T480-1-BL1616 is also known as APG Cash Drawer	APG-T480-1-BL1616	or T4801BL1616	.